***FINANCING AVAILABLE LOW MONTHLY PAYMENTS AVAILABLE***POWER SUNROOF***PREMIUM LEATHER INTERIOR***ALLOY WHEELS***ICE COLD AIR***AM/FM CD PLAYER***NO CREDIT NO PROBLEM***X3 3.0i, 4D Sport Utility, 3.0L I6 DOHC 24V, 5-Speed Automatic with Steptronic, AWD, Mystic Blue Metallic! There are used SUVs, and then there are SUVs like this well-taken care of 2006 BMW X3. 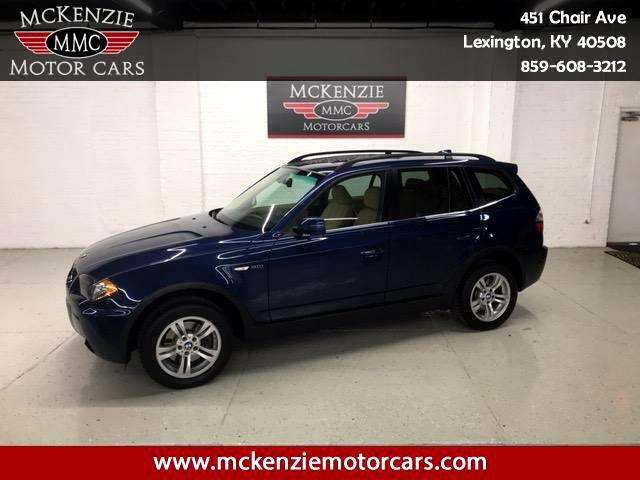 This luxury vehicle has it all, from a posh interior to a wealth of great features. If you want a creampuff with style, this is it. J.D. Power and Associates gave the 2006 X3 4 out of 5 Power Circles for Overall Performance and Design. If 2 heads are better than 1, the 4 tires must be better than 2! With AWD power delivery, you won't let Mother Nature get the best of you. This SUV is nicely equipped with features such as 3.0L I6 DOHC 24V, 4D Sport Utility, 5-Speed Automatic with Steptronic, AWD, Mystic Blue Metallic with Tan Leather X3 3.0i, 3.64 Axle Ratio, 4-Wheel Disc Brakes, 8 Speakers, ABS brakes, Air Conditioning, Alloy wheels, AM/FM radio, Anti-Theft AM/FM Stereo/CD/MP3 Audio System, Automatic temperature control, Brake assist, Bumpers: body-color, CD player, Delay-off headlights, Driver door bin, Driver vanity mirror, Dual front impact airbags, Dual front side impact airbags, Electronic Stability Control, Four wheel independent suspension, Front anti-roll bar, Front Bucket Seats, Front Center Armrest w/Storage, Front fog lights, Front reading lights, Fully automatic headlights, Genuine wood console insert, Genuine wood door panel insert, Illuminated entry, Leather steering wheel, Low tire pressure warning, Memory seat, MP3 decoder, Occupant sensing airbag, Outside temperature display, Overhead airbag, Overhead console, Passenger door bin, Passenger vanity mirror, Power door mirrors, Power driver seat, Power moonroof, Power passenger seat, Power steering, Power windows, Radio data system, Rain sensing wipers, Rear anti-roll bar, Rear reading lights, Rear seat center armrest, Rear window defroster. Email me price drops and new listings for these search results.